Yellow Birch is a large and valuable hardwood species in northeastern North America. 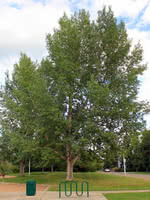 The bark on its limbs and young trunks is silvery-yellowish in colour, hence the name. This tree prefers to grow in cool regions with damp or saturated soil. Yellow Birch can be tapped for syrup, like Sugar Maple. Although the sap has less sugar content, it flows in greater quantity than maple trees.